We live in an era of innovations. If you aren't innovative enough, its hard to survive. Even the movie industry has left no stone unturned to come up with ideas that grab a lot of eye balls. Recently Dharma Productions partnered with Google to promote it's upcoming movie OK Jaanu. We can see a never seen before sponsored listing right below the search box. It says 'What do you call your Janu?' followed by six options to select from. 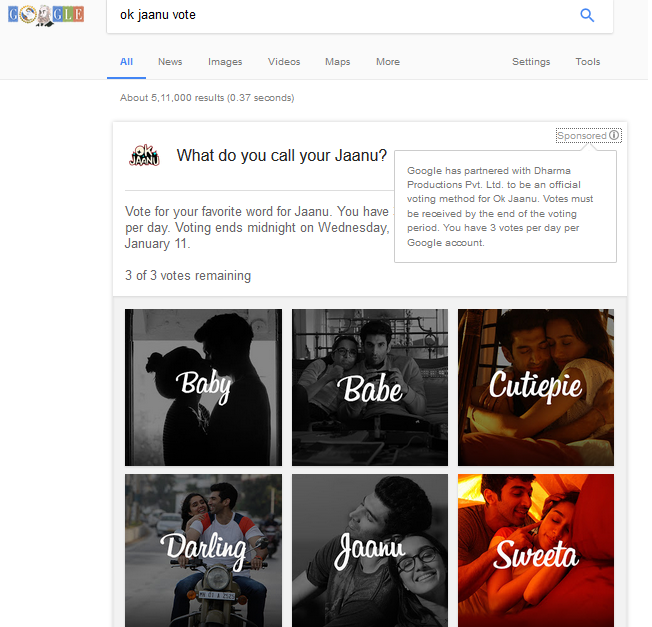 Google has partnered with Dharma Productions Pvt. Ltd. to be an official voting method for Ok Jaanu. Votes must be received by the end of the voting period. 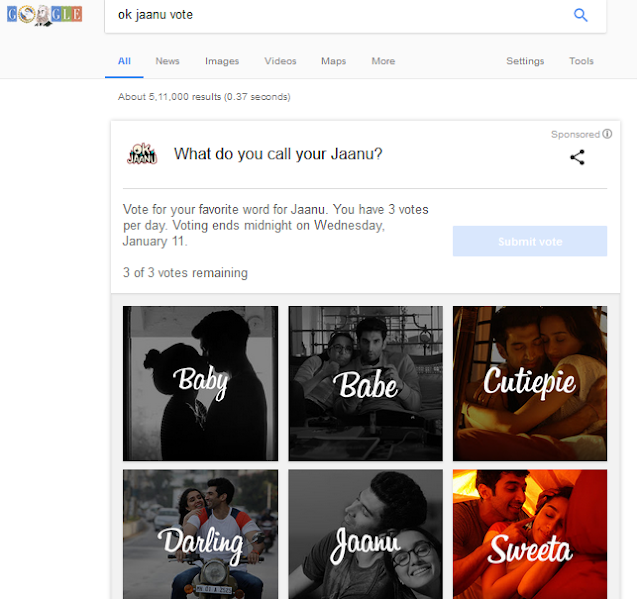 You have 3 votes per day per Google account. Google constantly makes several changes to its search result page layout. Knowledge graph, Top stories, local listings, featured snippets and what not. And now we have a vote snippet in form of a Sponsored listing that captures the complete first fold of our screen. We can definitely expect many such layout changes in Google search result page. But this one was really interesting. You can see a similar listing on Google Mobile search also. Looking forward to reading many more such updates. Is AMP a Ranking Factor? Should I Implement AMP? What is Crawl Budget and How to Optimise it? Do Google Spreadsheets Rank in Search Results?